A quintessential multi-talented artist, Manorama’s journey from a street artist to one of the most versatile, loved and respected south Indian actresses will go down as one of the most inspiring stories in Indian cinema. It took over half a century for Manorama, who was born as Gopishanta alias Pallathur Papa in Rajamannargudi in Thanjore district, to rise to the level of a historic comedienne par excellence and become a household name in south India. Aachi, as she was fondly called by her fans, died following a cardiac arrest at a private hospital here on Saturday, plunging the industry into gloom. She was 78 and is survived by her son and actor-singer Boopathy. She began her career as a street singer and occasionally sang for stage artists. It was during one such show, she was rechristened Manorama, and was forced to act because the heroine refused to play her part. Soon she joined S.S. Rajendran’s Nataka Mandram, and it was here that she was spotted by lyricist Kannadasan, who roped her in 1958 Tamil film “Malayitta Mangai”. Manorama was hesitant to take up the role as a comedienne, but destiny willed otherwise. 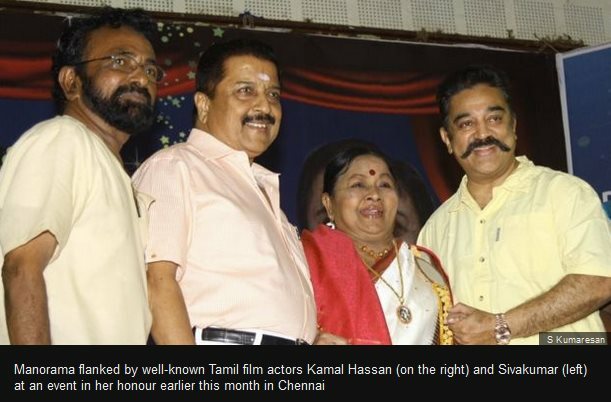 Manorama earned the love of the audience with her spirited performance in the film and went on to team up with stalwarts such as Thangavelu, Thengai Srinivasan, Cho and Nagesh. In 1963, she debuted as the lead heroine in Tamil film “Konjum Kumari”. In her role, she proved her versatility and her gift to render lines in different dialects with ease. Two years later, she starred in A.P. Nagarajan-directed Tamil mythological film “Thiruvilayadal”, and a year later she teamed up again with the director in “Saraswathi Sabatham”. Nagarajan made full use of Manorama’s acting prowess in the 1968 Tamil musical “Thillana Mohanambal”, and her role as Jil Jil Ramamani elevated her star status, earning her a large fan base. It was the performance of a lifetime. “Jil Jil is a role I fell in love with. Over the years, I became a fan of it. It was very special as it’s remembered even today by everybody,” Manorama had told IANS in an interview. Despite the presence of doyens such as Sivaji Ganeshan and Padmini in “Thillanaa”, Manorama earned critical acclaim for her act. Some of Manorama’s best roles were opposite comedians Cho and Nagesh, with whom she worked in over 100 films. 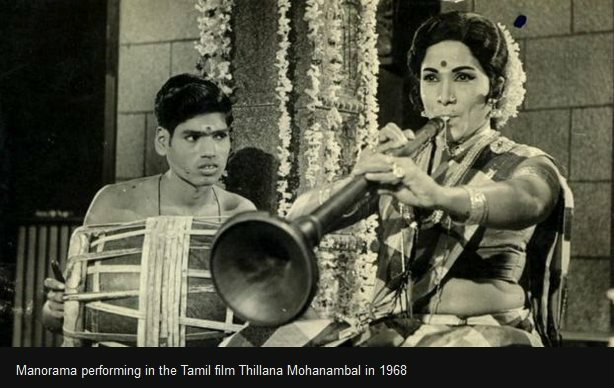 In the 1968 Tamil film “Bommalattam”, she teamed up with Cho and showcased her singing talent with the raging number “vaa vaathiyaare uttande”, and it broke new ground in the realm of comedy. Her rendition of the song in true Madras lingo was widely appreciated and she was soon referred to as Suraiya of South Indian Cinema. Manorama’s first stint with singing began under the tutelage of music director M.A. Kumar. In Tamil film “Magale Un Samathu” (1964), Manorama crooned the popular number “Thatha thatha pidi kudu” along with L.R. Eswari. She sang in about 60 films, a record none of her contemporaries could match. One of the most popular numbers was “muthu kulika varigala” from the Tamil film “Anubhavi Raja Anubhavi”, and it was later used in the film’s Hindi remake titled “Do Phool”. As a tribute to Manorama’s popular songs, HMV even released an album titled “Vaa Vaathiyaare”, which sold over a lakh copies. 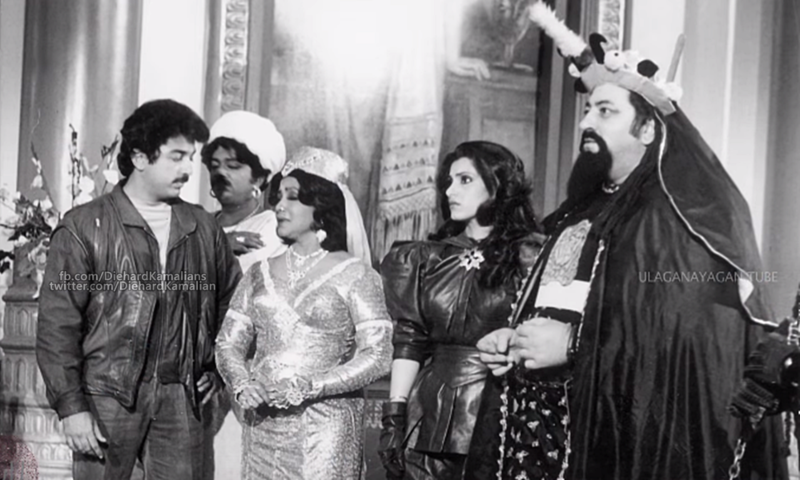 She made a very successful transition from a comedienne to a character artist and starred in memorable Tamil films such as “Singaravelan”, “Michael Madana Kama Rajan”, “Vazhve Mayam” with Kamal Haasan and “Billa”, “Thanga Magan” and “Naan Adimai Illai” alongside Rajinikanth. “One of the most difficult roles I ever played was in the film ‘Nadigan’. I had to romance an actor (Sathyaraj) much younger than me. It was quite challenging because I had to retain the dignity of the character,” she said. Her roles in “Chinna Gounder”, “Chinna Thambi”, “Kadhalan”, “Nattamai”, “Gemini” and “Saamy” proved the septuagenarian star’s talent in supporting roles. One of her best performances as a character artist came as a domestic help Kannamma in 1986 film “Samsaram Athu Minsaram”. Manorama in Visu's Samsaram Adhu Minsaram as Kannama has stood in hearts forever. In her sole Hindi performance she was paired with Mehmood in “Kunwara Baap”, and she dubbed her lines in her own voice. With over 1,000 films — some industry sources put the figure at 1,200 — across five languages (including Malayalam and Telugu) to her credit, Manorama achieved an unmatchable feat. Towards the fag end of her career, she even starred in Tamil television serials and a few advertisements too. She was the recipient of Kalaimamani award and bagged a National Award for her performance in 1989 Tamil film “Puthiya Pathai”. In 2002, Manorama was honoured with Padma Shri. Her last film was Suriya-starrer “Singam 2”. A few months ago when rumours about her sudden demise circulated, a confident Manorama said she was healthy and had even signed three films. Her fans hoped to see her back on the screen. The destiny willed otherwise.